The Mexican painter Frida Kahlo (1907–1954) is regarded as one of the great artists of the 20th century. Her celebrity status, achieved after her death, owes much to her turbulent life. The daughter of a German photographer and a Mexican mother, she survived polio at the age of six and a devastating road accident at the age of eighteen. Her indomitable courage and her powerful sense of self found expression in vibrant clothing and outré accessories. Chloë Sayer is an independent scholar and curator, specializing in Mexican art and culture. Based in London, she is a Fellow of the Royal Anthropological Institute of Great Britain. She lectures extensively, leads cultural tours to Mexico, and has made ethnographic collections in Mexico and Belize for the British Museum. Kahlo's private life and personal possessions will be shown for the first time outside Mexico in the upcoming exhibition Frida Kahlo: Making Her Self Up, which inspired this course. This course offers a deep dive into Kahlo's life, work in post-Revolutionary Mexico and legacy. An explosion of creativity followed the Mexican Revolution, as intellectuals, artists and photographers rejected European values and espoused mexicanidad. Kahlo and Diego Rivera were inspired by pre-Columbian art and by contemporary indigenous cultures. They collected pottery, toys, lacquerware and other forms of folk art. 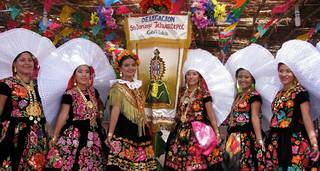 They also respected festive traditions like the Mexican Day of the Dead. In photographs and self-portraits, Frida was often flamboyantly dressed in Mexican or Guatemalan garments. Through her clothing, Kahlo expressed her boundless admiration for her Mexican heritage. Her inimitable style continues to inspire designers and fashionistas the world over.